The majority of people can see what is designated as a size 20 letter 20 feet away, and so are said to have 20/20 vision. Persons who can see close objects but cannot see the letters from this distance have myopia that is, nearsightedness. Nearsighted people can see close objects better than they can see objects at a distance. These individuals have an elongated eyeball, and when they attempt to look at a distant object, the image is brought to focus in front of the retina (Fig. 9Aa). They can see close objects because they can adjust the lens to allow the image to focus on the retina, but to see distant objects, these people must wear concave lenses, which diverge the light rays so that the image can be focused on the retina. Rather than wear glasses or contact lenses, many nearsighted people are now choosing to undergo laser surgery. First, specialists determine how much the cornea needs to be flattened to achieve visual acuity. Controlled by a computer, the laser then removes this amount of the cornea. Most patients achieve at least 20/40 vision, but a few complain of glare and varying visual acuity. Persons who can easily see the optometrist’s chart but cannot see close objects well have hyperopia - that is, farsightedness. These individuals can see distant objects better than they can see close objects. They have a shortened eyeball, and when they try to see close objects, the image is focused behind the retina (Fig. 9Ab). When the object is distant, the lens can compensate for the short eyeball, but when the object is close, these persons must wear a convex lens to increase the bending of light rays so that the image can be focused on the retina. When the cornea or lens is uneven, the image is fuzzy. The light rays cannot be evenly focused on the retina. This condition, called astigmatism, can be corrected by an unevenly ground lens to compensate for the uneven cornea (Fig. 9Ac). 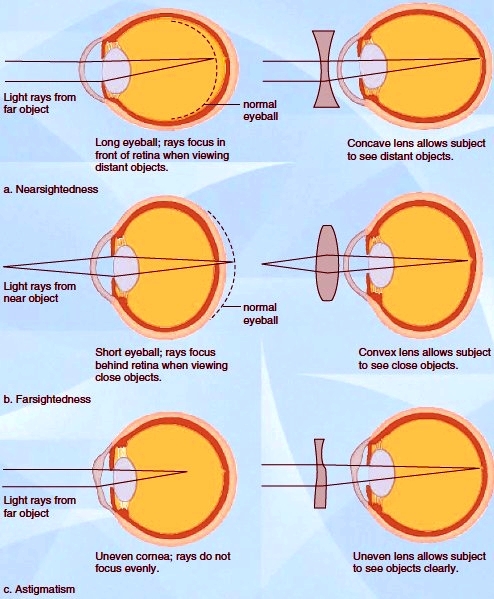 Figure 9A Common abnormalities of the eye, with possible corrective lenses. a. A concave lens in nearsighted persons focuses light rays on the retina. b. A convex lens in farsighted persons focuses light rays on the retina. c. An uneven lens in persons with astigmatism focuses light rays on the retina. As described in Figure 9.10, the retina is a three-layered tissue. The ganglion cells are the outermost layer, and light passing through the eye strikes these retinal cells first. The axons of ganglion cells form the optic nerve. Ganglion cells connect to the middle layer of bipolar cells. Bipolar cells then connect to rod and cone cells. The rod and cone cells are the actual photoreceptor cells, forming the deepest layer of the retina. When light enters the eye, it must penetrate the three layers-ganglion cells, bipolar cells, and finally the rods and cones. Recall that rods and cones contain the photochemicals that can respond to light. Rods respond to movement and changes in light intensity, and cones can respond to color. Once the rods or cones have responded, the nerve signal is sent backward through the retinal layers: from rod or cone, to bipolar cell, to ganglion cell, to the optic nerve, and from there to the visual cortex of the brain. If the photoreceptors-rods or cones-are destroyed, the individual will be blind, even if the rest of the visual pathway is undamaged. The most common cause of blindness in the Western world is age-related macular degeneration, which results in destruction of the macula lutea, a yellowish area in the central region of the retina. The macula lutea contains a concentration of cones, especially in the fovea centralis. Individuals with this condition have a distorted visual field: Blurriness or a blind spot is present, straight lines may look wavy, objects may appear larger or smaller than they are, and colors may look faded (Fig. 9B). There are two main forms of age-related macular degeneration. “Wet” macular degeneration means that abnormal growth of new blood vessels is evident in the region of the macula. The blood vessels leak serum and blood, and the retina becomes distorted, leading to severe scarring that completely destroys the macula. “Dry” macular degeneration is not accompanied by the growth of blood vessels, and visual loss is less dramatic. Heredity plays a role in the development of age-related macular degeneration: 15% of people with a family history of the condition develop the disease after age 60. Also, light-eyed people tend to be afflicted more frequently than dark-eyed people. Smoking, hypertension, and excessive sun exposure are possible contributing factors. Figure 9B Macular degeneration. When a person with macular degeneration looks at a clump of trees, the trees may appear larger or smaller than they really are, the trunks may look wavy, details may be absent, and the colors may be dim. A yearly eye examination assists in the early detection of many eye diseases, including macular degeneration, cataracts, and glaucoma. When an ophthalmologist presents an Amsler grid (a crosshatched pattern of straight lines) to someone with macular degeneration, the grid looks blurred, distorted, or discolored. Signs of the “wet” form can be detected by an examination of the retina and confirmed by a fluorescein angiogram. In this test, a number of pictures are taken of the macula lutea after an orange dye has been injected into a vein in the patient’s arm. Currently, the treatment for the “dry” form of macular degeneration is the use of vitamin and mineral supplements, which may help stem the disease. For example, research indicates that consumption of zinc may prevent further loss of vision. On the other hand, when the “wet” form of the disease is diagnosed early, laser treatment can sometimes stop the growth of blood vessels. Although people with age-related macular degeneration are classified as blind, they still have normal peripheral vision (outside the macula), which they can learn to use effectively. Because the periphery of the retina contains a high concentration of rods, vision there is less acute, and colors are not detected. But highpowered eyeglasses, magnifying devices, closed-circuit television, and special lamps can help patients see details more clearly. Accumulating evidence suggests that both macular degeneration and cataracts, which tend to occur in the elderly, are caused by long-term exposure to the ultraviolet rays of the sun. Therefore, everyone-especially people who live in sunny climates or work outdoors-should wear sunglasses that absorb ultraviolet light. Large lenses worn close to the eyes offer further protection. The Sunglass Association of America has devised a system for categorizing sunglasses, which is helpful. Science fiction often borrows heavily from science fact. The science fiction television classic "Six Million Dollar Man" of the late 1970s featured a "bionic" man with an implanted, telescopic eye that could zoom in and change focus. Fans of the 1990-era science fiction classic "Star Trek: The Next Generation" will certainly remember the character of Geordi LaForge, played by actor LeVar Burton. The character of Geordi was blind from birth. In the series, Geordi was equipped with special goggles that gave him vision superior to that of the average person. While these two sci-fi examples may have seemed far-fetched at the time, actual pioneering studies of retinal implant prosthetic devices began in the early 1990s and continue to the present. The devices show some promise of being able to restore limited vision to individuals with retinal destruction. Although the cone cells are useless, the ganglion cells in the retinas of these patients can still send nerve signals. Two types of "bionic eyes" are currently being studied: a subretinal implant and an epiretinal implant. Both devices are designed to directly stimulate the ganglion cells of the retina. The subretinal system is surgically placed below the retina. It is a simple and very tiny, solar-powered silicon chip. Electricity from the solar chip produces nerve signals in ganglion cells. The epiretinal implant, which sits on top of the ganglion cells of the retina, consists of several parts. A miniature digital camera and computer are mounted in special glasses worn by the user. The glasses can transmit information to a silicon microchip placed on top of the ganglion cells. A battery pack worn at the belt transmits power to the implanted microchip. Currently, clinical research has shown that subretinal implanted silicon chips do indeed stimulate the ganglion cells. Blind human volunteers have reported return of some vision after receiving these implants. In the most remarkable case, a totally blind patient was able to see his wife’s face for the first time in decades. Epiretinal implants have also triggered visual sensations in blind human volunteers. More important, these tiny silicon chips seem to be stable after surgery. They do not cause infection, irritation, or breakdown of the retinal tissue. Neither the subretinal implant nor the epiretinal implant is currently approved by the Food and Drug Administration for widespread use in patients. Both require further study and experimentation to ensure that they are totally safe and effective for use in humans. It is also important to note that these implants can’t restore perfect vision at present. However, as the technology allowing miniaturization of electronics continues to improve, the blind may soon be able to obtain a device that restores some useful vision. Future research may result in even better vision.